Escape the metropolitan madness of Marrakesh in favor of the tranquil Atlas Mountains on an enriching full-day excursion to Ourika Valley. Accompanied by a professional guide, follow a resplendent hiking trail thronged with rivers, mountains and waterfalls. 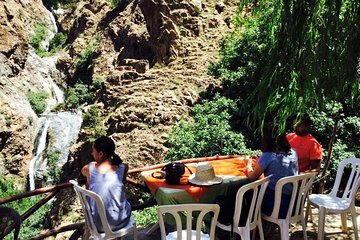 Opt to plunge into the refreshing waters of a waterfall; revitalize with traditional mint tea in an indigenous Berber village; and gain valuable insight into the cultural traditions of the area from your knowledgeable guide. Enjoy the convenience of round-trip hotel transportation from Marrakesh. The guide was great, a really friendly young guy with lots of stories of his travels round the world. The tour itself was not what I had imagined my fault probably. I was hoping to get into the wilds of the Mountains and see some real Berber life. What we got was a lightening quick tour of a Berber house right next to the road and then the obligatory visit to the adjoining shop. The trek was very steep and, although short, was pretty tough for anyone not used to this sort of thing. The falls at the end are quite nice but nothing special and the same could be said of the views on the way up. Overall it was a little disappointing being way too touristy for my liking. The trip to get there was actually more interesting than the place itself but I would still say it was worth the money because it was significantly cheaper than other tours I had seen. Great tour with a friendly guide!